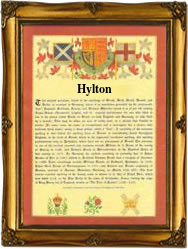 This interesting name is a variant form of the name 'Hilton', of Anglo-Saxon origin, which is a locational name from any of the various places so called in Cambridgeshire, Cleveland, Derbyshire and Shropshire which derive from the Old English pre 7th Century "hyll", a hill and "tun", a settlement. Others, including those in Cumberland and Dorset, have early forms in "Hel", and probably have as their first element the Old English "hielde", a slope, or "helde", tansy - a wild herb, thus either a settlement on a hill or slope or one where tansy grew. There are a few early examples such as Ralph filius Hilton (Yorkshire 1219), which point to occasional derivation from a given name, possibly a Norman name "Hildeen", composed of the Germanic elements "hild", battle and "hun", bear cub, filius meaning "son of". The marriage of James Hylton and Alice Parker was recorded at St. Bride's, Fleet Street, London, on June 11th 1602. The first recorded spelling of the family name is shown to be that of Roger de Hiltun, which was dated 1132, Abbey Rolls of Yorkshire, during the reign of King Henry 1, "The Administrator", 1100 - 1135. Surnames became necessary when governments introduced personal taxation. In England this was known as Poll Tax. Throughout the centuries, surnames in every country have continued to "develop" often leading to astonishing variants of the original spelling.